Beaufort is hands-down one of my favorite places in North Carolina. Three hours from Raleigh, the historic district has a great waterfront with some fantastic restaurants and bars, unique shops and great scenery. 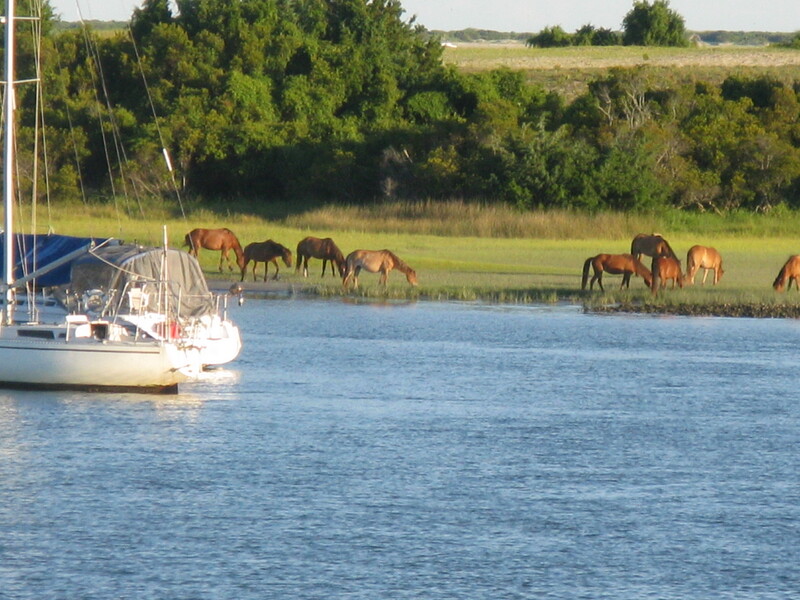 If you’re lucky, you may see some of the wild horses grazing on Carrot Island, which is just across the waterway. 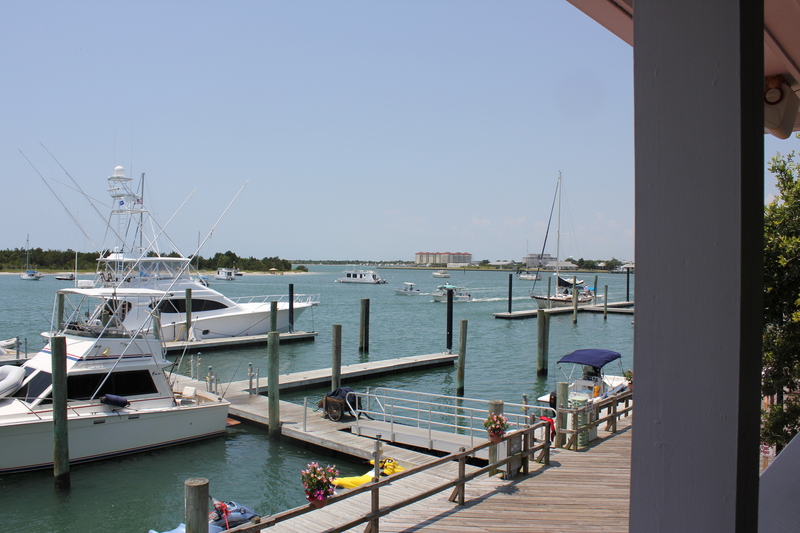 You can sign up for various water tours and cruises at the dock, or just kick back and watch the boats come and go at this charming little town by the sea. 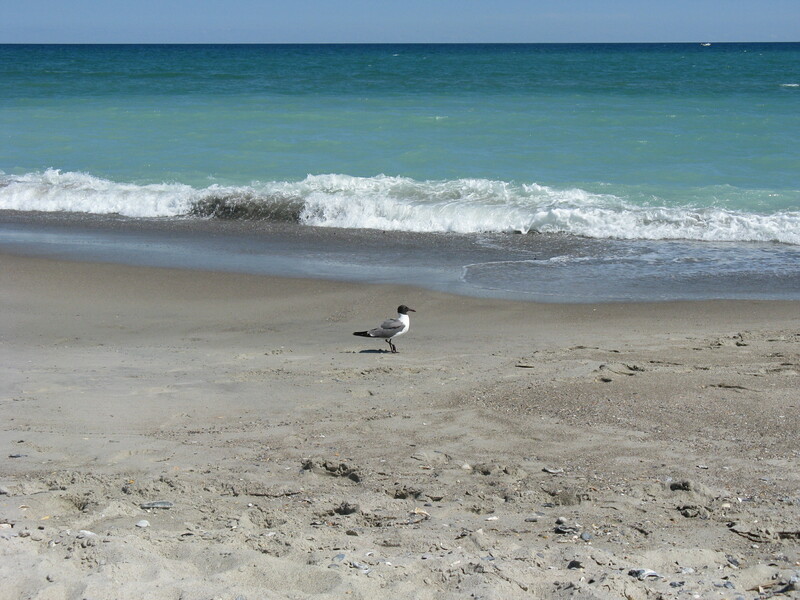 Unfortunately, you have to drive to the beach, but it is not too far away, approximately 15-20 minutes, depending on time of year and traffic. We like to go to Fort Macon, which is a great place to watch the boats go by, but no alcohol is allowed since it’s a state park. If you want to enjoy some adult beverages, head down Highway 58 and park at any of the public beach access places. 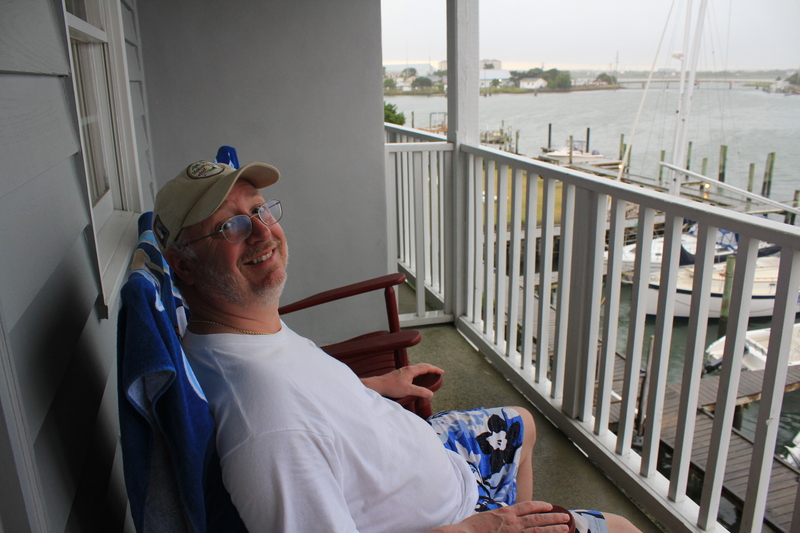 Brad and I recently celebrated our 10th wedding anniversary and stayed at the Beaufort Inn. When we decided to get married, we were torn between holding our ceremony in Beaufort or Blowing Rock, N.C. We wound up getting married in Blowing Rock at the beautiful Chetola Resort, which was a good thing since it was sunny and gorgeous that day in the mountains, unlike Beaufort where it was raining like cats and dogs. However, Beaufort will always hold a special place in our hearts and we visit whenever we can. 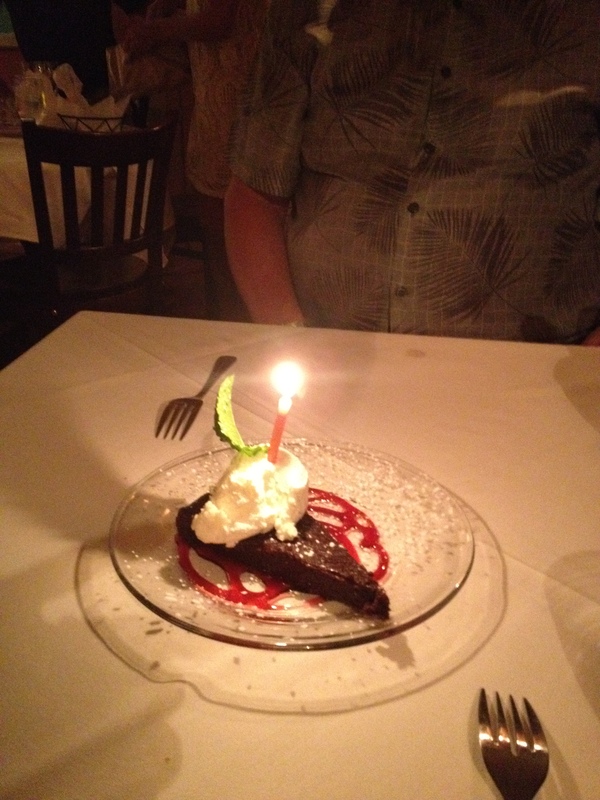 We decided to have our anniversary dinner at the Blue Moon Bistro and it was a great choice! Brad thoroughly enjoyed his rare yellow fin tuna, which was one of the specials and came with fresh succotash on the side. He said his fish was cooked perfectly (rare) and loved his meal. 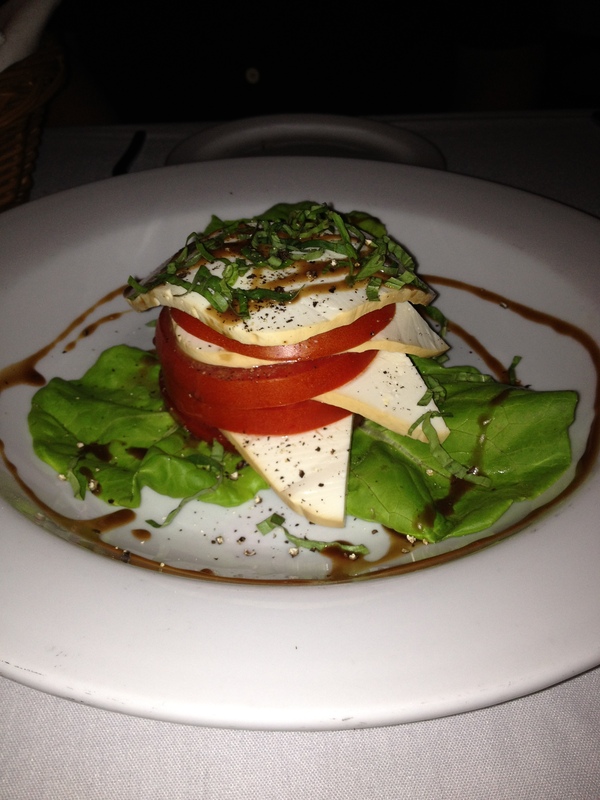 I ordered the Caprese salad (also a special) and it was as great as it looked. This needs to be a permanent fixture on the menu, at least when the ingredients are in season. 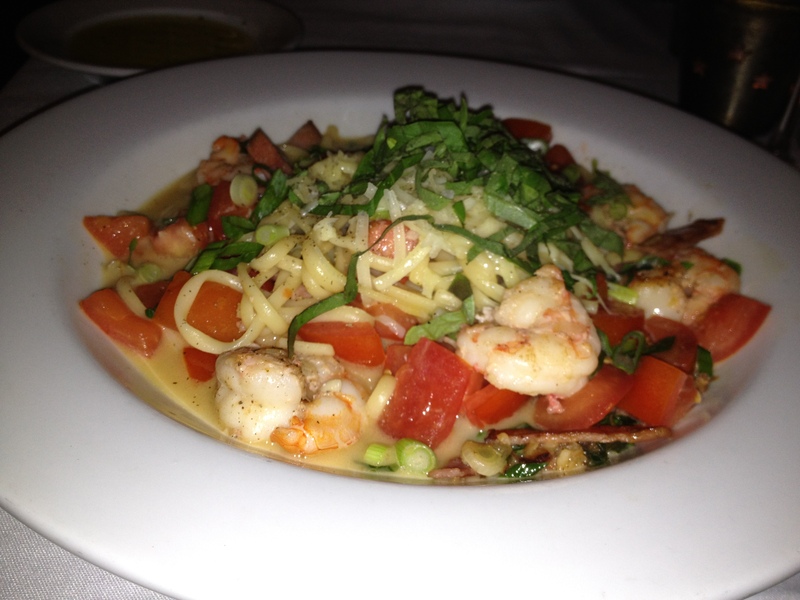 I also had the shrimp scampi ($24.95) which was some of the best I’ve ever tasted. What made it so good was the addition of locally grown tomatoes and sweet basil. This stuff rocked! Blue Moon Bistro is one of my favorite restaurants ever – every meal I’ve had has been top-notch. The only improvement this place could make is not having the tables so close to each other, especially the tables for two. But the food truly does make up for it. This is a great little place to shoot pool, enjoy tunes on the jukebox and just chill out. Nothing fancy here, just some ice cold beer and decent bar food. The cheeseburgers (which come with special chili sauce, mustard and onions) are fantastic and cheap, cheap, cheap at $2.25! Add some fries ($1.25) and you are set. The Cru Wine Bar is a combined wine store, wine bar and coffee shop. 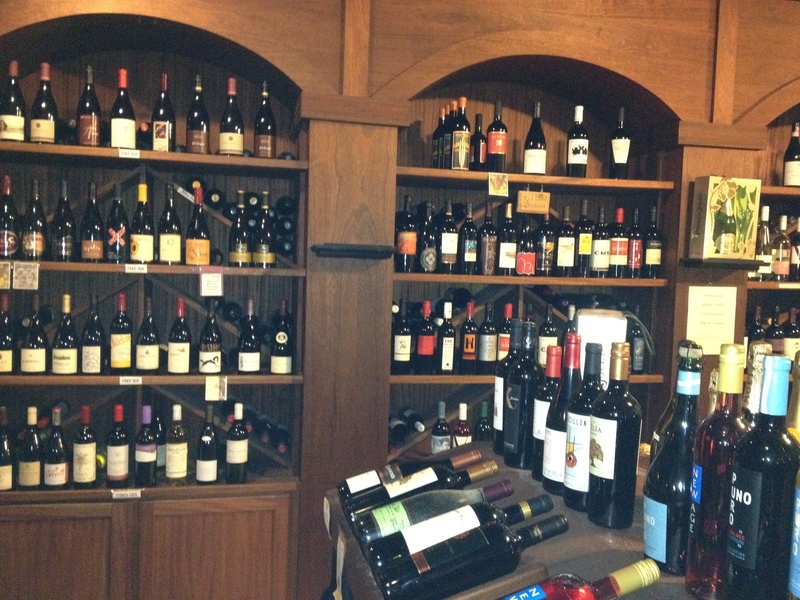 It has the area’s best selection of wines and specialty beers that you can enjoy in its bar or carry out. Cru recently began to serve liquor and has daily drink specials. As far as food, you can order Escazu’ artisan chocolates and tasty light fare that includes pizzas, quesadillas, hot soups, sandwiches and more. Cru has live music on the weekends. 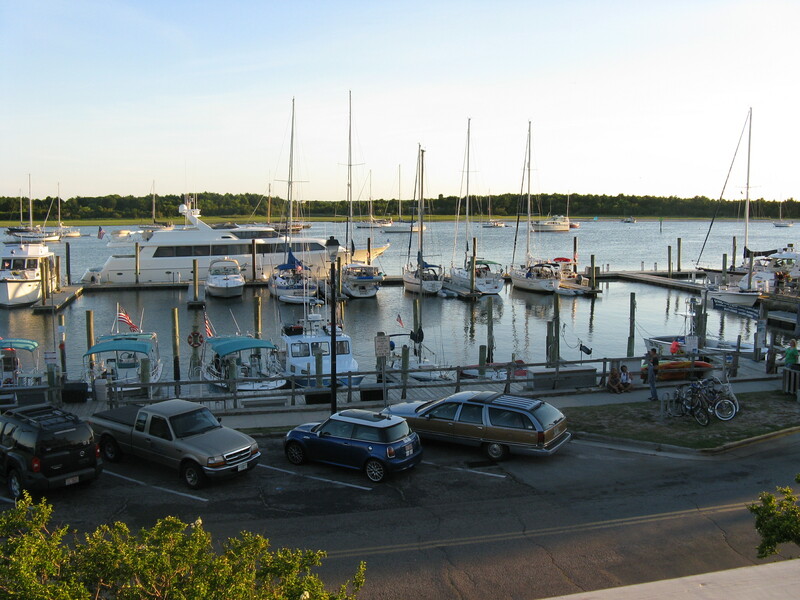 This is a laid back place and a must visit whenever you are in Beaufort! This is a Beaufort institution and appropriately named as it is right on the dock. If you are lucky you may get to see the wild horses on Carrot Island, which is just across the canal. There is nothing pretentious about this place. 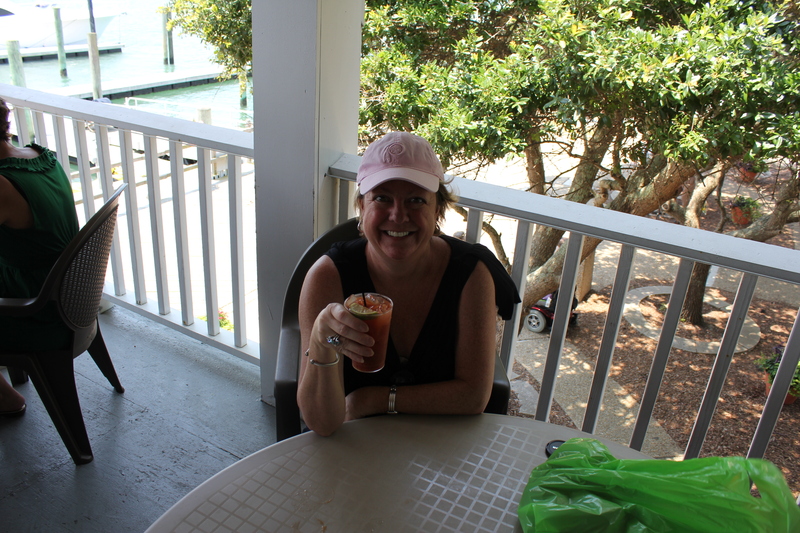 The food is okay, nothing special, really, but the Bloody Marys are fantastic. According to our server, the Bloody Mary mix is homemade, with fresh cracked pepper and a good amount of horseradish. This is a great place to listen to live music, especially in the summer. Or just sit and soak in the view, like this one from the upstairs deck. My dear friends Anne and Carlton introduced me to Clawson’s many years ago when we were headed to the Outer Banks for Thanksgiving and decided to make a couple of pit stops in Beaufort and Ocracoke Island on the way. Clawson’s has a small but good selection of beers on tap (eight of them to be exact) and luckily it has one of my favorites – Dead Guy Ale. I seriously miss its shrimp salad pitas that I have tried to replicate and blogged about earlier. 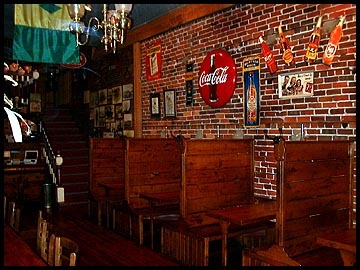 The bar is non-beachy – lots of dark wood, exposed brick, etc. Foodwise, try one of the dirigibles (huge potatoes stuffed with various ingredients), any of the wraps or the crab cake burger. Good food, fun bar with lots of history! This is Clawson’s sister restaurant and just a bit off the beaten path, just behind Front Street. 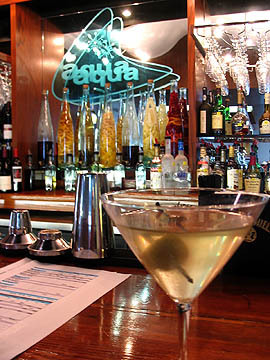 Aqua is known for its tapas, small and big plates, wine and martinis. I love to get appetizers here – this time we enjoyed oven baked coconut shrimp with mango chutney ($6.00) – excellent! It has a decent wine list and on Fridays all bottles are 33% off. Aqua prides itself on offering fresh, local products and supporting local fisherman and farmers. 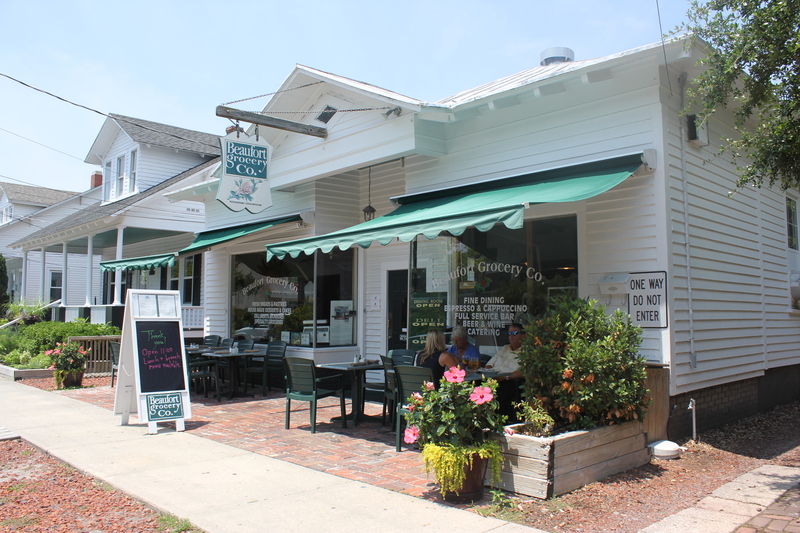 This is another of my favorite restaurants in Beaufort. We usually eat dinner here, but on this visit we had Sunday brunch for the first time. Awesome! 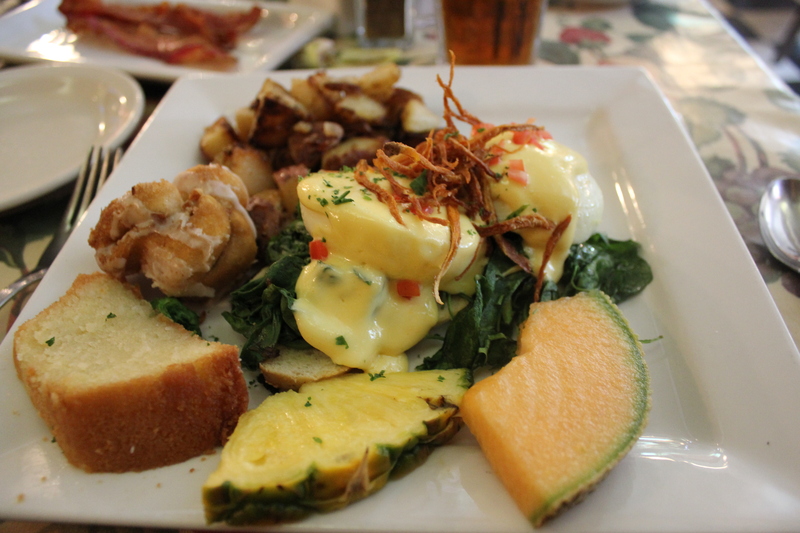 I had the Eggs Florentine ($10.99), which were great – the spinach was garlicky and tender and the hollandaise sauce was perfect. I was able to order my eggs how I wanted them (soft). It came on parmesan red neck rusks, a nice alternative to the traditional English muffin. I had to wait until noon to get my mimosa ($6.00), but it was worth it with freshly squeezed orange juice and a nice pour. Brad had the Omelet Down East ($10.99), a three-egg omelet with ham, scallions, cheddar and Swiss cheeses. We each got hash browns instead of grits. Both meals came with fresh fruit, a cinnamon roll and coconut pound cake that was extremely moist. Both of us had food left over. Open for lunch, dinner and Sunday brunch, I highly recommend this place! 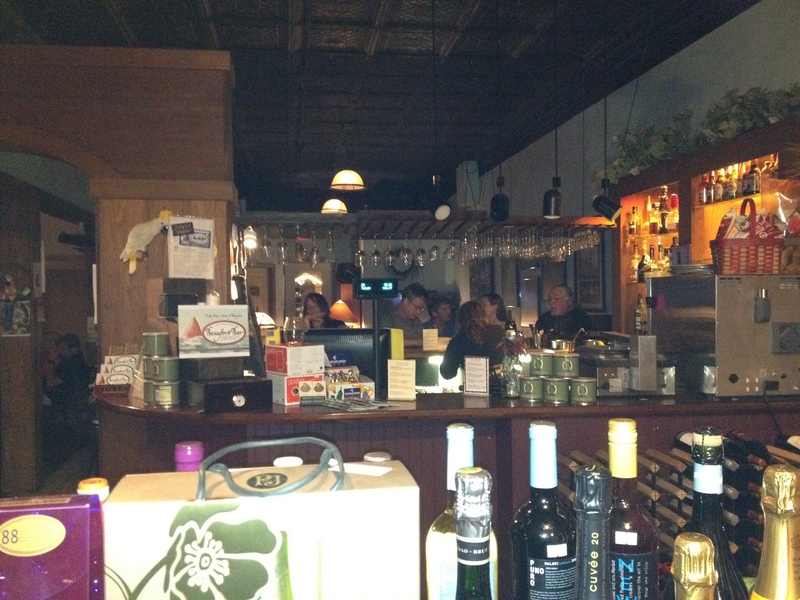 Another one of my favorite Beaufort restaurants – I love this place! We were lucky to get a table next to a window overlooking the water. I’ve been eating here for years and love its current location. 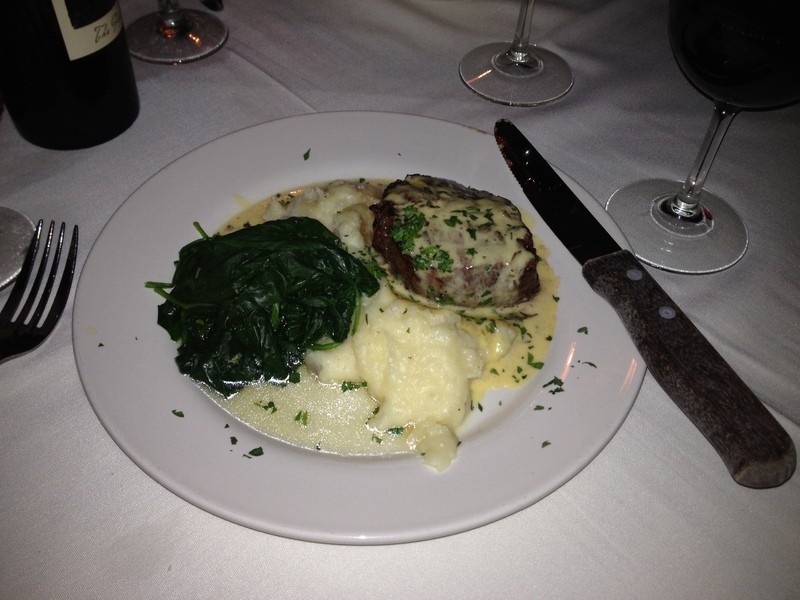 Brad had a filet with mashed potatoes and yummy sautéed spinach ($27.95), which he thoroughly enjoyed. I had the Seafood Jambalaya ($22.95), which had shrimp, lump crab, smoked sausage, etc. over jasmine rice. Nice presentation and the flavors were quite good. We mentioned we were celebrating our annivesary and they brought us a chocolate brownie topped with vanilla ice cream with raspberry swirl – yum! Front St. 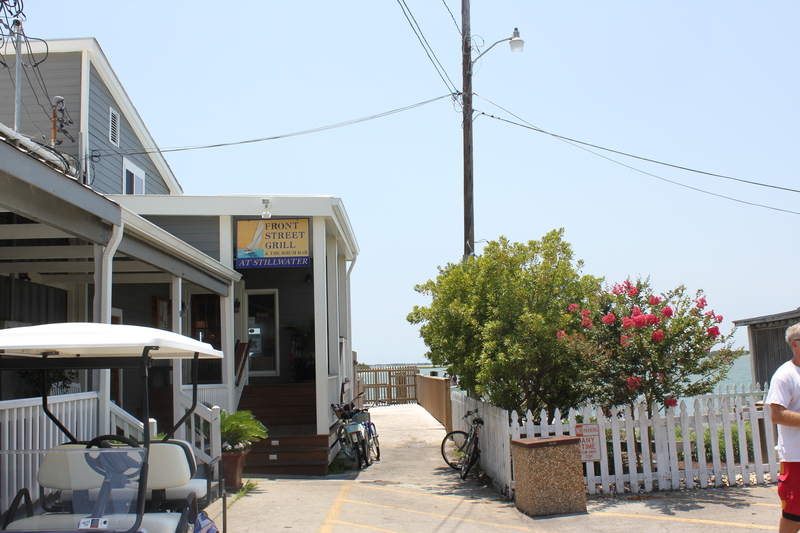 Grill also has outside seating, right on the water, and is open for lunch, dinner and Sunday brunch. 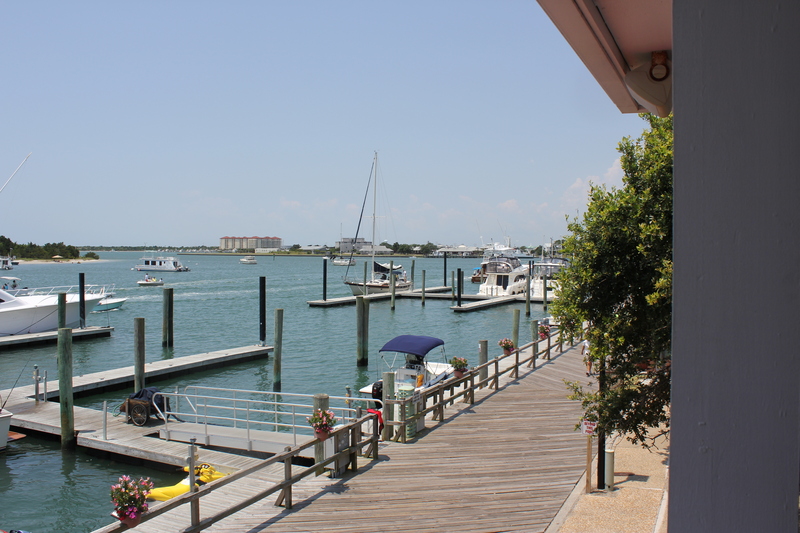 In addition, there is an outside waterfront bar that serves light fare and drinks all day, in season. 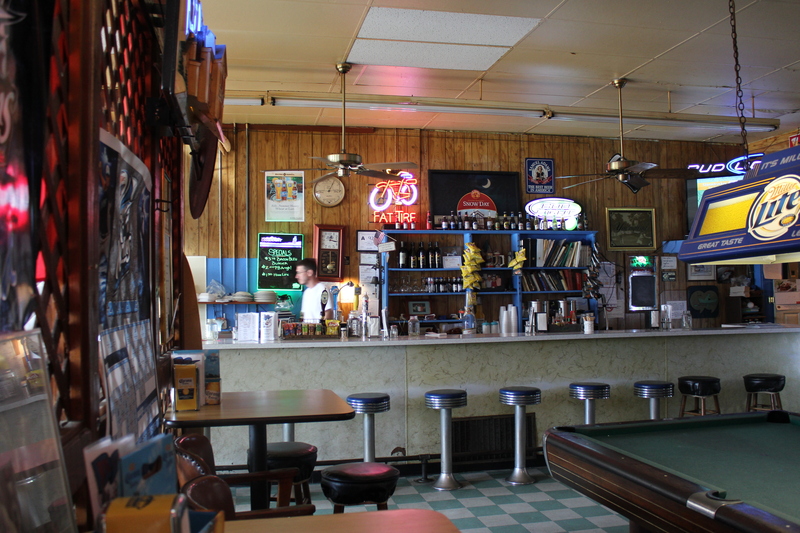 A trip to Beaufort would not be complete without having a beer or three at this dive bar. It is THE best dive bar ever! This is a local hangout, with live music upstairs, year round. I love the little enclosed patio, where I had my share of beers with the late and greats Charlie Murray and G. Keith Whitley. Hey T.O., if you read this, road trip next Memorial Day if I’m there – I’ll drive! 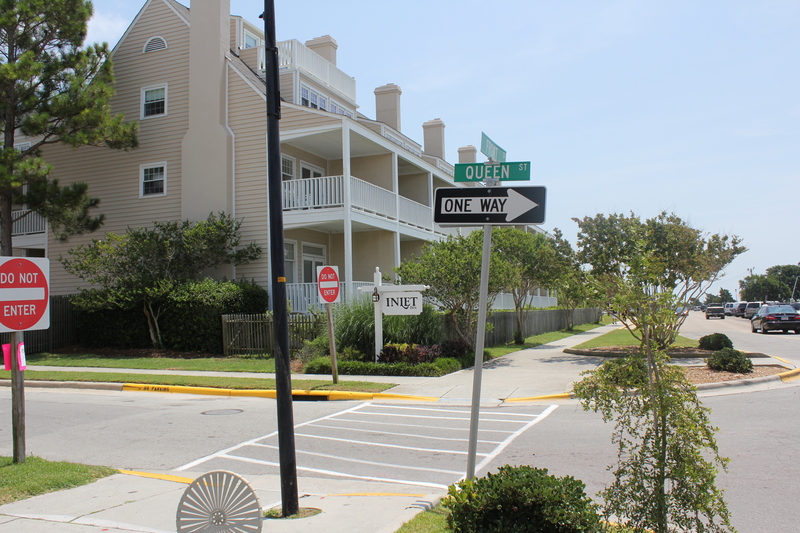 Other places in downtown Beaufort that we like but did not visit on this trip include Ribeyes Steakhouse (yes, it’s a chain with decent food), the Spouter Inn and Finz Grill. I was sad to see that Sharpies closed. It had great burgers and a one of the best wedge salads I’ve ever enjoyed. It’s now a Mexican place that I plan trying on a future visit. 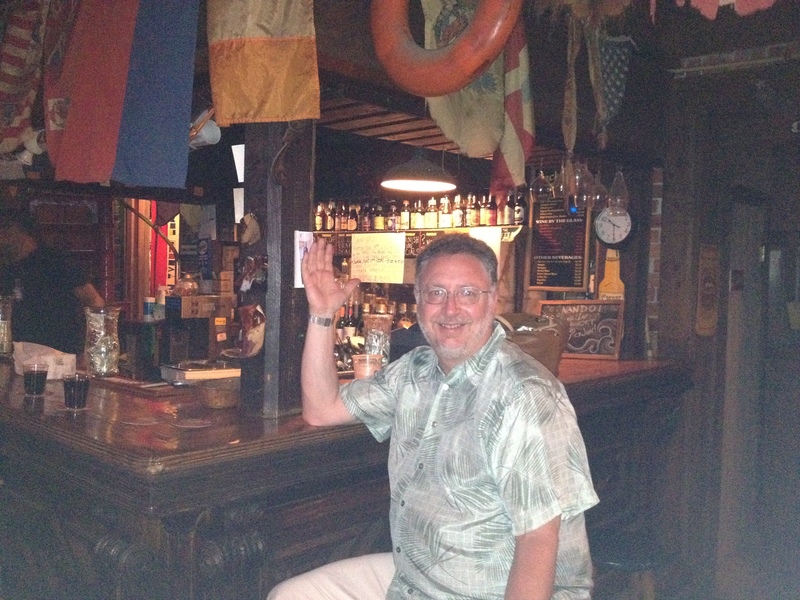 Before I end this post, I would be remiss if I didn’t give a shout out to the Beach Tavern. BT is not in Beaufort but in Atlantic Beach. It’s a must stop after a day at the beach when you are heading back to Beaufort. 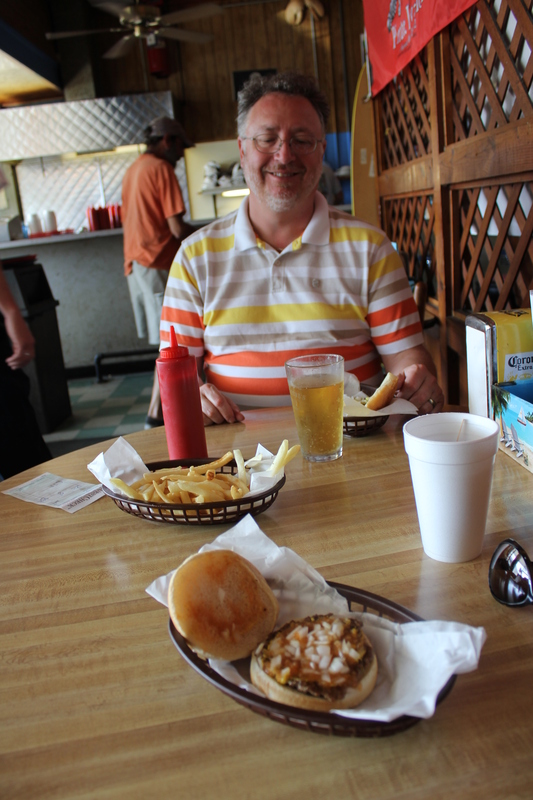 I’ve been going to the Beach Tavern since I was in college and still love its satisfying (and cheap) hot dogs and ice cold beer! This is another great dive bar that is friendly on the budget. 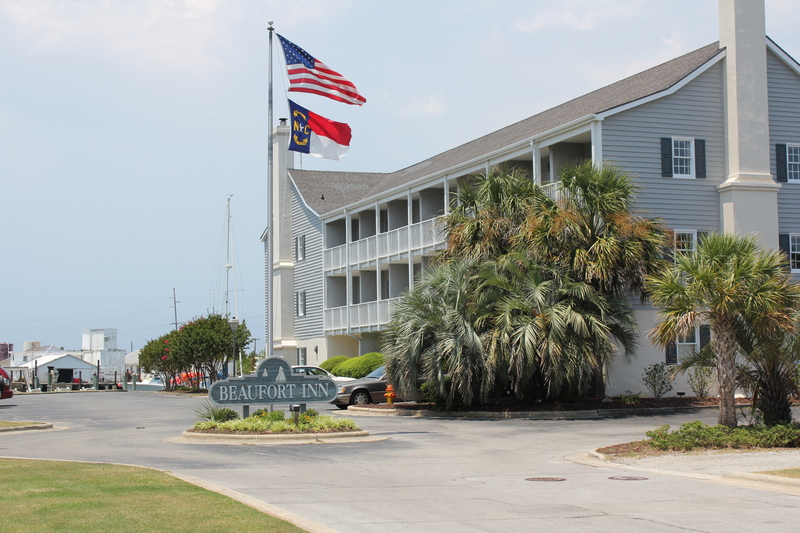 So, next time you find yourself on N.C.’s Crystal Coast, make time to stop by Beaufort, if not to stay then at least for a meal or drink at one of its many fine establishments and a walk around the quaint waterfront. *Note – photos of Aqua, Beach Tavern and Clawson’s are from their respective websites – my pics did not turn out. This entry was posted in It's 5:00 Somewhere, My Favs, Restaurant Reviews and tagged Aqua Restaurant Beaufort NC, Backstreet Pub Beaufort NC, Beach Tavern Atlantic Beach NC, Beaufort Grocery Company Beaufort NC, Beaufort N.C., Beaufort NC restaurants, Blue Moon Bistro Beaufort NC, Clawson’s 1905 Restaurant & Pub Beaufort NC, Cru Wine Bar Beaufort NC, eat drink and be merry, Front Street Grill Beaufort NC, kel's cafe of all things food, Kelley Chisholm blog, Royal James Café Beaufort NC, The Dockhouse Beaufort NC. Bookmark the permalink. I almost feel as if I were in Beaufort. I like to go in the fall and hang out at the Dockhouse and watch the boats. I really need to go back down there. 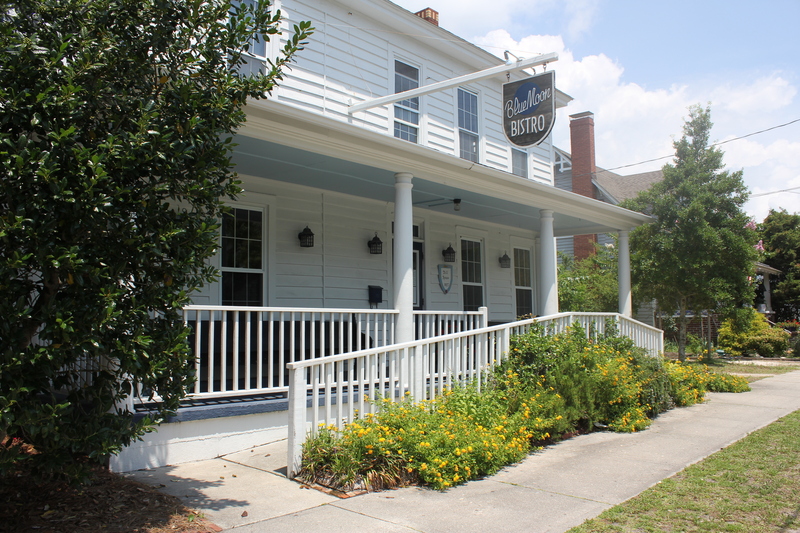 Definitely going to bookmark this and try these places next time I am in Beaufort! I have been to Cru and Clawson’s, but need to try these other places! Have fun! 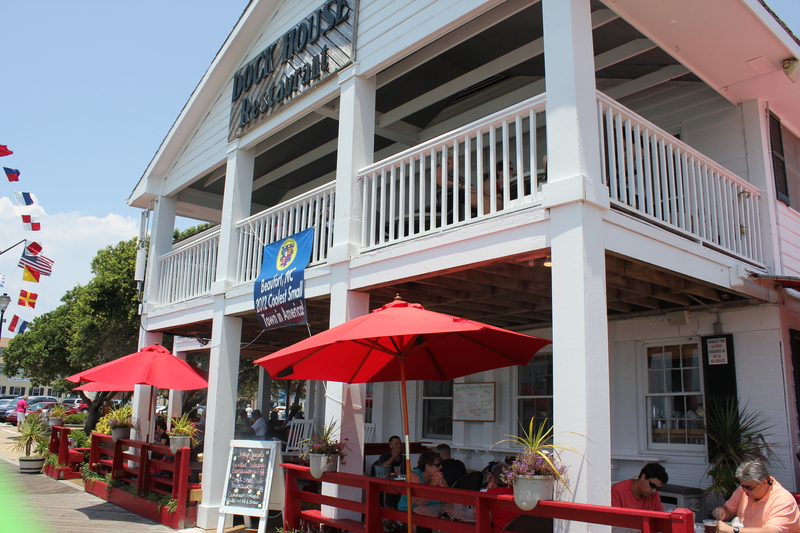 While Blue Moon and Beaufort Grocery don’t have waterfront views, you will not be disappointed with the food! This is one of your best reviews! Even if I recognize some of the hangouts from our trips Memorial Day, it’s a treat to have the inside scoop on the food … as we didn’t do much eating on these visits. Thanks, Ronda – You know how much I love Beaufort! If I get to spend more time next year at Memorial Day, we will definitely go for lunch! Thanks, Bob. We’re so lucky to be only a few hours away from this great little town. I agree – great post! Now I have a few new places to try next time we go!! Thanks Jennifer! Let me know before you go and I’ll give you more insights.